In the early nineties I was struck with the home brewing itch like a lot of others. Like most of us in the home brewing community I dreamed of opening my own micro-brewery. Never one to miss an opportunity to follow a dream, over a couple of years my brother Tony and his partner Deb Rivest and I hatched a plan to do just that. After much rejection from the banks and skepticism from friends we sold our houses to raise the money and waded into the brewing & restaurant business. 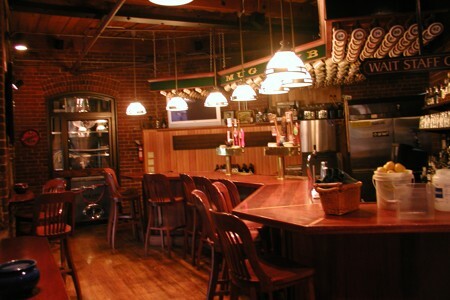 We designed and built Elm City Brewing Co. at the Colony Mill Marketplace, a renovated brick mill in Keene NH. As is our inclination, we built everything we could ourselves. This included building all the tables and booths, the bar, installing the kitchen and brewing system and of course doing all the sign and advertising work. We opened for business on December 10th 1995, and after a steep learning curve, we got a handle on it and have enjoyed 11 years of success.